Habit: Perennial herb. Stem: 3--6 dm. Leaf: ligule 2--12 mm, acuminate; blade 4--12 cm, 1--2 mm wide, flat; midribs, margins +- white; tip with awn-like extension of midrib, 3--10 mm. Inflorescence: 4--10 cm, 5--8 mm wide, spike-like, densely flowered. Spikelet: paired, pair with subtending axis segment falling as 1 unit; lower spikelet staminate or sterile, upper spikelet bisexual; glumes 1--2 mm, unequal, awned, lower glume 2-veined, 2-awned, awns 1--3.5 mm, upper glume 1-veined, 1-awned, awns 2.5--5 mm; lemma 3--4 mm, short soft-hairy on lower 2/3, awn 1.5--3 mm; anthers 1.5--2 mm, yellow. Chromosomes: 2n=40. Synonyms: Lycurus setosus (Nutt.) C. Reeder; Lycurus phleoides Kunth, misappl. Citation for this treatment: Paul M. Peterson 2012, Muhlenbergia alopecuroides, in Jepson Flora Project (eds.) Jepson eFlora, http://ucjeps.berkeley.edu/eflora/eflora_display.php?tid=89226, accessed on April 19, 2019. 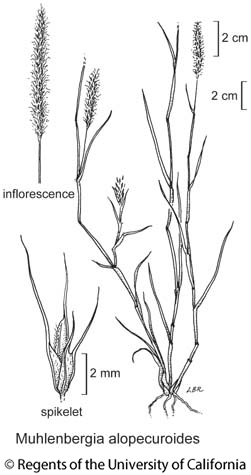 No expert verified images found for Muhlenbergia alopecuroides. e DMtns (New York Mtns); Markers link to CCH specimen records. Yellow markers indicate records that may provide evidence for eFlora range revision or may have georeferencing or identification issues. Purple markers indicate specimens collected from a garden, greenhouse, or other non-wild location.